Bad Penny: 4 Airports. 3 flights. 2 days. At Sydney's airport on Christmas day, we changed our Australian money to USD, the currency of choice in so many developing countries. The smell of the bills rushed our memories; funny that we remembered the smell so distinctly, but strange that the smell remained on these bills, so far from home. How can plain paper and denim have such integrity; how can it keep its characteristics across the world? KLIA is not without its charms. An outdoor jungle room, with rainforest plants and piped in jungle sounds. A sculpture collection of Malaysia's most famous native species, the huge stinkflower featured on the Simpsons and the orangutan. The Malaysian airport also gives one thoughts to ponder. For example, Malaysian doesn't have its own script, so everything is transliterated into the Latin alphabet. The native, Chinese-based script slowly surrendered first to Arabic then to European colonial rule. Vietnam's script only became Latinate under the French. So recent, but so much forgotten. 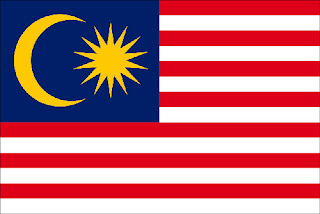 Another example: the Malaysian flag is nearly identical to America's. It has the red and white stripes, the blue field. Just instead of white stars for states, it has a yellow crescent moon and star for Islam. All of these charms are fully enjoyed in your first hour at KL International Airport. And yet you have another 8 hours of black night under bright fluorescent lights before your flight to Phnom Penh. Going into an unknown city at midnight doesn't seem wise. So you try to get some sleep. In the airport. The lights are blaring. The airport intercom plays a few annoying tones every time an announcement is made, and the repetition of those tones seeps into the shallow, fitful sleep you hold onto with white knuckles and fingernails after a few hours of uncomfortable twisting on hard seats and a hard floor. A Christmas night so grim. Six hours of this sleepless sleep, children screaming, and in the morning, yet another flight to board. There is absolutely no redeeming value to air travel. Except maybe this: my boarding pass for the flight to Phnom Penh is for "DALAL, NIJAMS." That's gold. At Phnom Penh's airport, we wait at the muggy outdoor terminal, eating noodle soup and drinking beer. The PA system is playing "Jingle Bells," literally the one song we thought we wouldn't hear. We meet Patrick, a French-Canadian hippy weirdo, with a long lost front tooth. He's on his way to Bangkok, too, so we talk about passport design, about Thailand, about Canada and Celine Dion. We wish we hadn't talked about Celine Dion, and order more beer to wash her out of our mouths and minds. One more flight, and finally, we're at our destination. Victory is ours. 4 Airports. 3 flights. 2 days. Bangkok. Patrick wheels and swings us around the parts he's already seen. Khao San and Rambuttri. Trok Mayom. Street names that sound like Hindi mashed right up against Chinese. "Chakra" slammed into "pong," thus, Chakrapong, a busy artery of Banglamphu. Though this city has been through several stages of Western-style development, with all its faceless concrete box and roller door numbers, you can still occasionally catch a wooden Thai house, up on stilts, hiding from the march of time among its more modern counterparts. 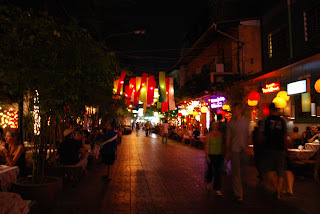 You can find lanterned laneways, beautiful places to drink and talk about luck and dreams, deja vu and the astral plane with a charming and garrulous French-Canadian hippy, with stringy ditry-blonde hair in a ponytail. But it'll still smell like piss. Our guesthouse is in a serious backpacker warehouse zone; it looks a bit like Public Storage, but the entrance is in this weird little alley, filled with old giant teapots, carts, bamboo ladders. These teapots could make 20 litres at least. Huge. There are stray cats in all the corners, looking a little more than half wild. Bangkok is squished, smelly and has very little graffiti. We walked until we were too tired to keep walking, past the hideous, onerous, ridiculous Democracy Monument and back. We ate at an Indian restaurant. As we left the place, we found ourselves suddenly in the kitchen of another restaurant. People will open up shop anywhere in this city; so long as there's a cooker and a little space, they will cook. The street food vendors choke the footpath; pedestrians walk in the middle of the street, occasionally stepping aside to let a scooter pass. At an intersection, we came upon a huge group of white people, playing drums, dancing, drinking and generally throwing themselves a party. Women in sarongs jiggled vulgar and threw their hair around. Men rocked their pelvises back and forth. Why travel to Thailand to do this? 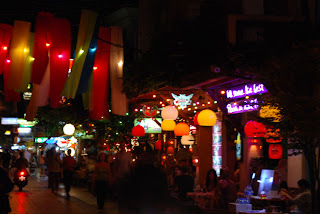 Patrick laughed and clapped along, "There's always something happening in Bangkok!" I thought our friendship might be wearing a bit thin. Craig and I looked at each other, one of us choosing amusement, one of us choosing disgust. Sleep came easy that night, and by the next morning, Patrick was gone. We don't even have a picture of him.